In the world today, there lies a great demand for a good sense of fashion. The combined efforts of the designers, the makers and the sellers are responsible for a gorgeous dress to end up beautifying the body of a pretty woman. Trendy clothes are hardly denied by anyone. Some passionate fashion freaks look forward to enhancing the beauty of the dress by matching the right kind of accessories with them. Kurtis not only depict the Desi essence of India but also reflect a contemporary sense of style when worn with bottom wear such as leggings. This is why exactly Kurtis fall under the category of fusion fashion. 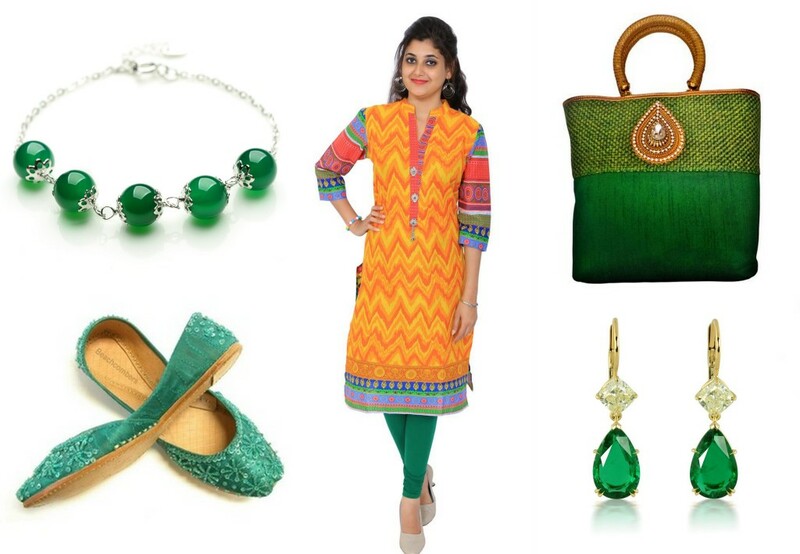 Choosing the right set of accessories plays a crucial role in making the Kurtis look much more elegant and enthralling. Footwear: Sometimes the fact that he shoes of a person reflect his sense of fashion and trend update has to be considered. Mismatched footwear for a pretty Kurti could easily take the charm of the Kurti away. Hence it is important to carefully choose the right kind of footwear. Wedges and heels with simple straps and a combination of contrast colors should be chosen and not the ones that obstruct the beauty of the fabulous kurti that one wears. Clutches and purses: There is no particular rule while choosing the right handbag. It is in fact necessary that the most attractive bag is chosen while paying close heed to the details of the kurti. Evident colors of the dress lose their looks when a bag of the same color takes over. The delicate work hidden in the kurti is what is to be looked for while matching a hand bag for the same. Ornaments: Nothing can beat the grandeur of an individual who gives some time to collect the right set of jewels for each dress. It is indeed an art that involves a sense of updated fashion-related knowledge. Beautiful dresses are highlighted even the more with added jewelry that go well with the dresses. Jewels polish and give the final touch to one’s appearance and are known to mark the tradition of our country. Earrings, either studs or hangings, both have their own unique ways of making a woman’s face look attractive. It also is important to buy the right kind of bottom wear to make the kurta appear much more elegant. Sometimes, the need for dupattas also arises. Although one may have to mix and match dupattas, the essence that it can add to the dress as a whole, is very high indeed. One can easily find the right kind of kurta among the several kinds and style available. There is no limit for sizes and colors. The wide range of beautifully stitched Kurtis is exhibited flawlessly under one roof online. Designer Kurtis that are made particularly for parties and events are a must-buy at the online store. The fitting is often very perfect and seeks no alteration in most cases. The clothing material is of very high quality and of genuine material. The perfection that lies behind the stitching is unmatched. The accessories required can as well be purchased online. The best online store so far for buying Kurtis is mirraw.com. The addition of accessories is sure to brighten the appearance of the dress worn. Designer Kurtis are portrayed better than they actually are with the addition of such accessories. A perfect fusion of several contemporary style of jewelry proves to be nothing less than an amazing look for a woman. The trend of wearing kurta has spread so virally that foreigners choose to wear Indian style Kurtis. A woman should also focus on carrying herself after wearing all the above mentioned accessories thus supporting the enriched beauty of the kurti. Choosing the optimum size is the key to making sure that it looks well-fit and gorgeous. The fashion icon is made only by bearing in mind the imagination of what a kurta would look like when worn with a particular accessory. It is very easy to get an entire wardrobe replaced with the bets of the best collection now that the entire field has come online. The images look totally promising and are definitely of the same quality when delivered. One need not have a second thought about the genuineness of the product at any point of time. Summary: Kurtis are being wanted everywhere these days for the comfort that they give and the prices that they are of. If purchased at the right store, they are sure to help women flaunt their beauty. 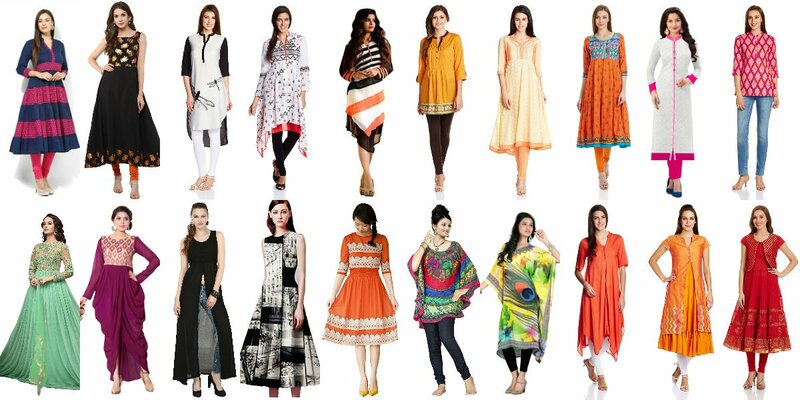 The most gorgeous and enthralling collection of Kurtis are now a few clicks away to fashion lovers and trendsetters. One can indeedlook for a particular kurta that goes just right with the party that she would be heading to!